The first time I was ever hit on via Myspace message by a guy who was clearly not my age and probably married, was very much like the day I found out there was a person inside the Chuck-E-Cheese costume. Real creepy. It seemed to break a spell since I was a relatively new social media user. I had a live-journal in high-school and was pretty AIM-literate. I was not prepared to find out, however, that people would or even could use the site for false if not predatory means. This was also around the time that many of my girlfriends were using Photoshop to edit their pictures and they looked good. Suddenly we could be models and random boys from exciting places like Santa Cruz were writing me Myspace messages saying “U look like Eva Longoria. Ur hawt.” And though I knew nothing about these boys besides their bad spelling, I was still quite flattered and definitely hooked on the digital make-overs. Now that this little demon of my dark past is exposed, I have to say I was quite embarrassed and guilt-ridden when I was listening to NPR’s Bryant Park Project podcast and an interview with Jeff Hancock, associate professor at Cornell University, who has come up with a “method” or at least some hints on how to tell if someone is lying to you in their social media profiles, resumes and other online places where personal info is logged. Since you generally can’t observe the body language of someone who wrote a blog, Hancock has some theories about how to tell if someone’s lying, one of them being that online-liars tend to take the personal pronoun out of their speech. For example, in a profile sentence, someone would say “Interned in New York” instead of “I interned in New York.” Another way to spot a liar is that they also tend to, according to Hancock, explain and, really, just type a lot in an effort to prove their statement even if proof is not requested. Much of the research and data collected were from dating sites where singles have something to lose and it is that fear that drives them to lie. The truth could mean unattractiveness but also ostracism from the dating scene. There’s more to this problem, though than just blemish-hiding, over-exposed Myspace and Facebook pictures. If it’s so easy to lie online, then what’s to stop this pattern from seeping into the business side of the internet. Apparently, it already has. Let’s remember the Edleman and Wal-Mart blog situation that gave all PR bloggers a black eye when their Working Family’s For Wal-Mart blog was outed as a PR blog. CEO Richard Edelman, said, in a blog statement, that they had failed to be completely transparent. AH! There we have it. Transparency. What do we risk sacrificing by investing in the internet, the promised land of cheap and easy social media opportunities? Transparency. The only upside about this situation is its reciprocity, which is the exact reason why all of my PR instructors here at the University of Oregon say “be transparent, be honest, have integrity in your work, be TRUTHFUL!” Truthful information can be as available on the internet as false information. So if I lie, chances are, people will find out. In the career world, I feel like I have more to lose as from internet lies than people on dating sites. My professional reputation is at stake. As a student, it’s even more important for me to be purposeful in what I write and publish as fact because I don’t have a solid resume yet to save me from even minor blunders. Caution is vital because one particularly frightening aspect of this situation is that as PR people participate in social media, we are communicating with a world full of tweaked identities and false demographics. This is a bad thing. And if we, too, partake in the opportunity to hide behind the online anonymity, we are contributing to and validating this audience full of phony and fabricated lives which severely limits the capacity of the messages we craft and put out. In the online PR world, we must value truth as much as we value promotion and buzz. Until we do, we’ll always be trying to rise above stains on our collective professional reputation left by the mistakes and oversights from our colleagues. To me, that sounds exhausting and I have other things I’d rather be doing. 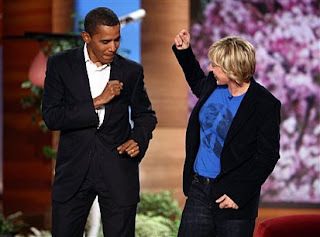 I am one of hundred of thousands of people who watched the popular YouTube video of Barack Obama dancing on the Ellen Degeneres Show. It’s a charming clip of him dancing to Beyonce’s “Crazy In Love”. At the time he was barely on my radar. My sister was reading his book and my brother had his campaign signs up in his yard. It was this video that prompted my attention to him and his campaign. This isn’t the first time YouTube stepped up Obama’s entertainment-driven campaign. After the New Hampshire primaries, as I blogged about earlier, Will.I.Am of the Black Eyed Peas produced a music video “Yes We Can” based off of Obama’s speech there and since it was posted on Youtube 3 weeks ago, it’s had almost 5 million hits. Last week, though, on an episode of HardBall, the host, Chris Matthews, was interviewing Texas State Senator Kirk Watson about his recent endorsement of Obama. The segment was a duel interview with a Clinton endorser also being questioned about several aspects of her candidate of choice. Matthews asked Senator Watson to list off the legislative accomplishments of Barack Obama and Watson said he could not name specific accomplishments. When asked if he could name any, he again was speechless and in this painful clip, he is seen grasping for straws. Once again, I’m puzzled to see whether these endorsements can help or in this case harm a candidate and perhaps cost them a primary on March 4th. In a recent post from Kelli Matthew’s blog, external and internal client-PR professional relationships are discussed and seven suggestions are included on how to maximize mutually beneficial rapport. Mark McClennan of Schwartz Communications “Crossroads” blog also explores this topic with a Valentine’s Day twist, “moving forward from PR puppy love”, and encourages PR practitioners to make their relationships meaningful. I suppose I’d never thought of this relationship as anything more than professional discourse, an exchange of services for fees. In comparing the two blogs to my own limited agency and client experience, I decided to analyze how I measure up to these tips for successful PR professional to client relationships. My current client moves slowly when it comes to acting on the PR resources that my team prepares for them. This is understandable because, as a non-profit, they have to be careful and make wise decisions about the publicity tactics in which they invest. Most of our PR work is preparing online media resources for our client: website features, Google ad space, blogs, etc. We want them to be not only available online but also internet savvy since many people will probably research their products and resources before purchasing them. What ends up happening is that they are hesitant to jump on projects that my team has painstakingly prepared because we are in total belief that they are useful tools for what the organization wishes to accomplish. One thing that might contribute to a potential relationship problem is that we see ourselves as a separate entity from the organization rather than team players striving toward the same goal. As we work toward their goals we must understand that their goals are our goals and hopefully our methods will become their methods. Kelli and Mark have some good suggestions on ways to succor this situation and most of them, if not all, deal with communication. Weird. And crazy since this is a communication-based practice. The thing that made my little PR ears perk up was number 3 on Kelli’s blog: Seek a peer-to-peer relationship. This might prove difficult in my case because my client and my team aren’t peers. The PR team is a group of student interns and the client is a non-profit organization that has been doing what they do for decades. Kelli’s post suggests turning the project into a “joint venture environment” and showing the client that my team also has a vested interest in the results of the PR strategy. This makes sense, because, really, we do. We want our press releases and FAQ’s to get published so that when we’re looking for jobs, we can refer back to the work we’ve done. Our client wants publicity for their cause. These basic goals make our involvement in the project personal and ensure a healthy professional relationship as explored in Mark’s blog. It was actually very clever. He uses somewhat cliched relationship jargon (ie. communication, commitment, compromise) and applied them to the professional relationships. I liked his point on commitment the best. He asserts that committing to both the project and the client are key because inattention and ignorance of the “little things” do not go unnoticed. Lastly, I read an article this afternoon by Elizabeth Albrycht, Founding Fellow of the Society for New Communications Research which said something that resonated with me and this subject in particular. The purpose of public relations is to foster trust between clients and their publics which is compounded from the trust of clients and their PR practitioner. The article also states that the measurement of a good relationship is gagued by how much each party is invested based on their engagement. This is the conundrum of public relations. The success of a plan or strategy cannot be measured in the work itself but rather how the parties involved were influenced and engaged by the work. The above mentioned article actually had some good things to say about social media and how to stimulate a client’s interest in it. I suggest a read-through for those interest. You can find it here. Yesterday I received a text-message from my brother with this picture and it was captioned “Hi, I’m calling to ask you to support Barack Obama.” This is my nephew Diego Soto. My brother, Diego’s dad, is an avid Obama supporter and this was a genius move, really. I have to say, if all of his endorsers looked like this, the election would be in the bag. I’m confident of this because I sent this to most of my friends and relatives via cellphones and e-mail and their sentiments were similar to mine. Diego’s joined the ranks of Will.I.Am. and Obama Girl. Leave it to Barak Obama to inspire even the smallest of us for change. Attention Batman Viral Marketing followers. Peep the links I’ve listed below! 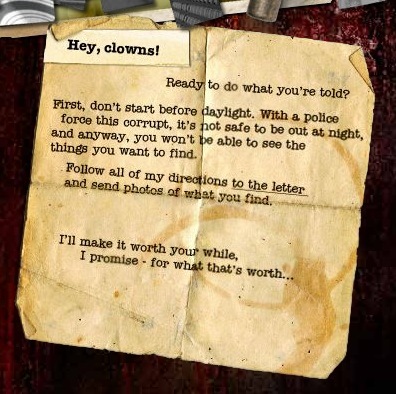 Here’s an example of what I was talking about. And the following site. Seriously. Read the features if you can. Every article and even ad is written as though a legit story. Job-Search Saga: Resume? CV? – Let’s Call the Whole Thing Off. A recent guest post on PRos in Training discussed the idea of the spiritual resume – a documentation of relational and emotional achievements or skills drawn from professional experiences, rather than technical skills learned as with your traditional resume. This is something I have not tackled yet. I did, though, as of yesterday tailor and rework my resume to send to submit it to several internship locations, most notably, Hill and Knowlton in New York, Chicago, San Francisco, London, Brussels and Paris. You should know that the last three locations were chosen by the mere fact that it would be AMAZING to actually get an internship in one of these cities. I wish, in applying for these internships I had the confidence of a person who has worked at several minimum-wage jobs since the age of 16 and with a college education who is about to apply at McDonalds. But we’ll see, right? This is, after all, only Chapter 1. One problem I faced, though, in applying internationally, is the subject of the CV – or Curriculum Vitae – versus my resume. Quite honestly, reworking my resume into a CV wasn’t that big of a deal, I just had to include a section that told my nationality and languages known (conversational Spanish and French) as well as my gender. The problem was, however, as I looked over the past 6 years of my life, I wondered just how, with this one document I could manage to sell myself to an international job market. It’s a daunting thought. But to be prepared, I’d advise making up a CV for the sake of it to anyone who’s job-hunting and perhaps looking overseas. It’s super easy and could very well come in handy.